In Brooklyn, funding for community programs is extremely competitive. Not for profit organizations must show they are successful at improving the lives of more people for less money. The client’s focus on greater transparency of their organization and operations is a key part of their success with attracting resources. We applied their idea of transparency to the architecture to make the project an exhibition of the client’s ambition for increased levels of openness. The project space is located on the 3rd floor of a landmarked bank building. Open topped partitions were arranged as a freestanding box inserted into in the existing space. Divided into rooms, program functions inside the 12’ tall block are expressed via different insulation colors - pink for private offices, blue for storage, tan for classrooms. A pass-through was created at the far end to allow complete circulation. The Box’s partitions are clad with corrugated plastic sheets, installed at 45-degree angles to match the structural metal strapping behind while revealing fiberglass, denim and rockwool batt insulation within. 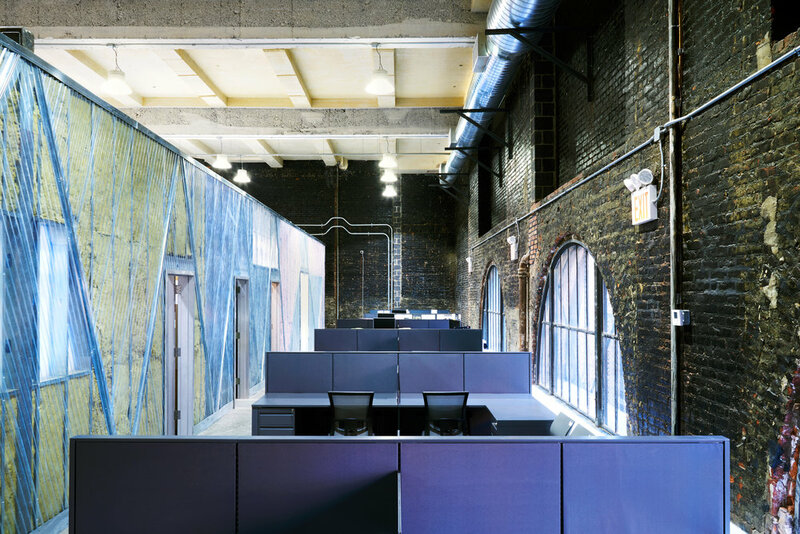 The partitions’ display of function and construction, and use of unfinished materials establish an aesthetic with connection to the organization’s focus on economy and purpose.